HIPG CEO Ray Ren, HIPS CEO Captain Ravi Jayawickreme, HIPG COO Tissa Wickramasinghe, and Hambantota Tissapura Junior School Principal A. H. Weerakeerthi laying the foundation stone. 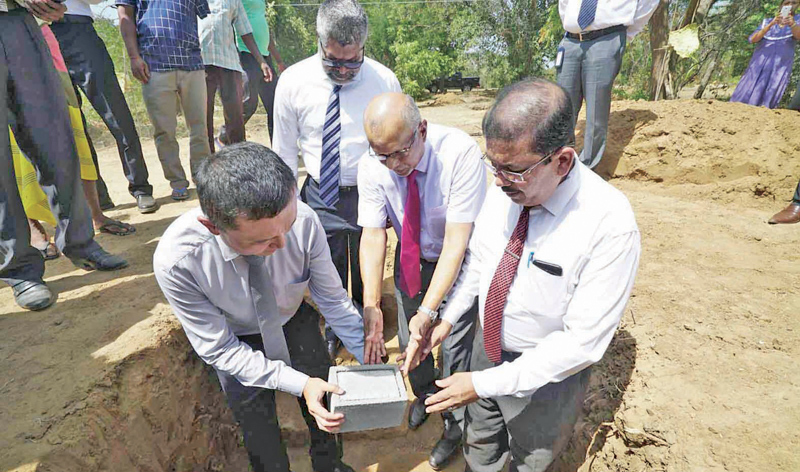 The foundation stone ceremony for the reconstruction of the Tissapura Junior School, in Andalla Weerawila in the Hambantota district, was held recently at the school premises. Participating in the laying of the foundation were Principal A. H. Weerakeerthi, along with key officials of the Hambantota International Port Group (HIPG), CEO Ray Ren and COO Tissa Wickremasinghe, and Hambantota International Port Services CEO Captain Ravi Jayawickrama. The Tissapura school is one of many community projects undertaken by HIPG. The grant to rebuild the school was made by China Merchants Charitable Foundation (CMCF), the primary CSR arm of global port operator, CMPort, the main partner of HIPG. It was brought to the company’s attention that Tissapura Junior School, a government public school built in 1986, needed renovation. The school some 300, including preschool and primary school students, and 24 teachers. HIPG has allocated a sum of US$ 200,000 for the renovation of the school which will be equipped with all the basic facilities required for modern learning. The new additions to the school include two new drinking water tanks with filtered water pipes, eight new classrooms, a playground and a wholly repaired roof.